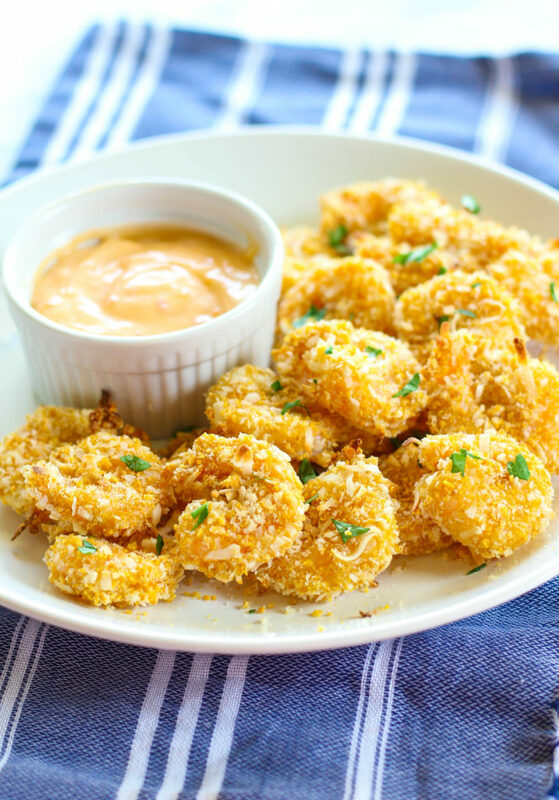 Fresh shrimp are breaded with Panko, cornflakes and sweetened coconut flakes and baked until crunchy. 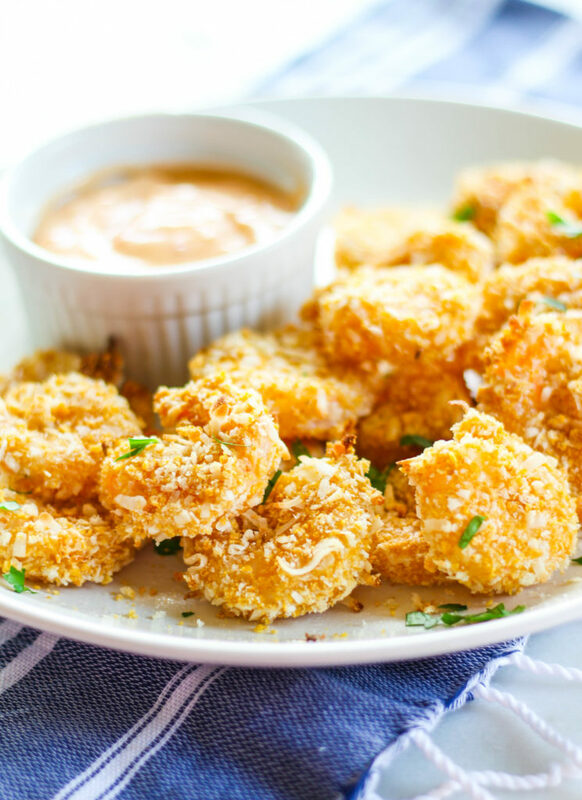 These coconut shrimp are served with a sweet chili mayo sauce. Perfect for a party appetizer or even your next meal! You don’t even want to know how long these lasted after I took their picture. But I’m not going to lie to you, so I will happily admit that these were completely demolished within a two minute time frame. Anytime Nick is gone and I get to cook my own meal, I automatically choose something seafood. Because he’s weird and doesn’t eat it. He was at his parent’s house for Father’s Day last weekend– which means shrimp for me! We had recently tried Skinny Taste’s baked coconut chicken tenders, which are so good that I’m making them again tonight. I decided to use the same ingredients but try using shrimp instead. And oh boy. They were so delicious. Crunchy, sweet, salty, savory, and when you dip them into the sweet chili mayo you add a creaminess and some spice. My mouth is watering just looking at these pictures. As I type this, I’m sitting at the airport in Austin waiting for my flight back to Dallas. I was in Austin for the Texas Association of School Nutrition’s annual conference, for my new role at Dairy MAX! I had a great time with my coworkers but I’m glad to be heading back to my own bed (and kitchen). 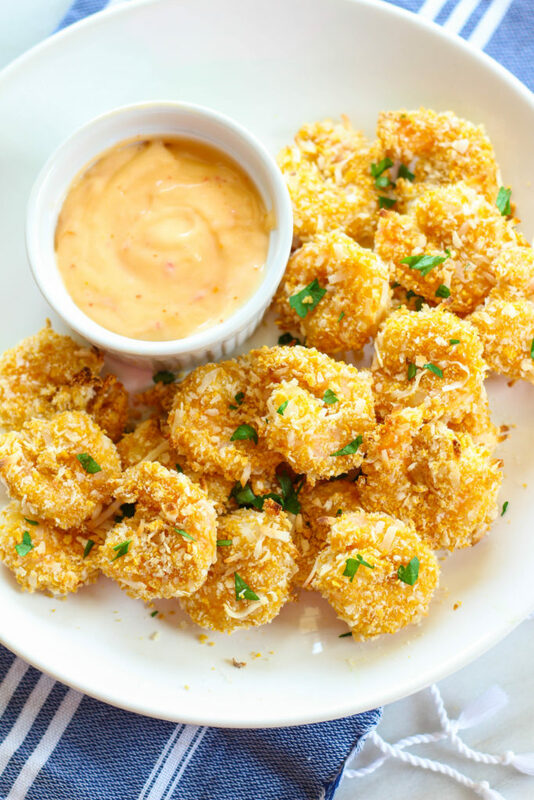 If you love popcorn shrimp, you’ll love these! Breaded, baked shrimp have the same crunch as fried, with less oil. The coconut taste isn’t too strong if you’re not a fan of coconut. It just adds a hint of sweetness to the breading. TIP: You can actually buy crushed cornflakes in a box. Look for them in the breadcrumb section in the baking aisle. Total game changer! Here’s the recipe for Baked Coconut Shrimp! Preheat your oven to 400 degrees F. Rinse the shrimp and pat dry. Set aside. Place wire baking rack onto baking sheet. Coat with cooking spray. Combine the panko, coconut flakes and cornflake crumbs into a shallow dish. Whisk the egg in another shallow dish along with a splash of water. Dip the shrimps, one by one, into the flour, then the egg, then the panko mixture. Bake for 8 minutes, flip, then another 8 minutes until the shrimp are curled up and golden brown. Meanwhile, whisk together the mayo and sweet chili. Serve immediately! i love the idea of added crunch from cornflakes!!!! I can’t wait to try these! Coconut and shrimp = winning combo! Hahah thanks! I totally want to make them again..